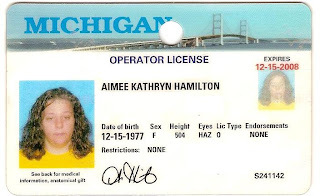 Please...don't ask me why I have this scanned...but yes, this was my drivers license from Michigan. One nice thing about that license - no weight is listed! I have no computer. When I lived with my parents I used theirs - now there is nothing. No happiness to my life anymore.... ha ha ha. Totally kidding. Okay, so I'm writing this on my cousins computer (which, incidentally is a Mac....I need one of these). Wanted to at least update you on the latest happenings. Yeah, there is not much going on. My birthday was yesterday. I'm 31. That doesn't even look right to me. Ugh. Oh well, guess that means I'm officially a grown up. Still feel like I'm 24 - young and dumb. Guess now I'm just old and dumb! ha ha ha. Some friends from church took me out for dinner and a movie on Friday night. That was really cool. I had fun. Have some pictures that I want to post....when I get a computer. Which may be some time soon, like in January - so watch out. Until then, I'll be living my life vicariously through my friends on Facebook whom I can chat with on my phone. Sort of. And I don't have to pay for texting. Yeah, pretty awesome! Well, I hope to write some more before my cousin leaves and takes his laptop of happiness from me...till then, this is Old Dawg Hamilton, signing off. I know most of you know this, but God is just awesome! I recently moved to Queen Creek, AZ. I moved in with my aunt. I have my own room now people. So, many of you know about Bert. Bert was a friend of mine about 7 years ago until I had him whacked. Its true. He was a cyst and he was big and he was on my fallopian tube. He met his end on an operating table in Nov. 2001. Now, For the last 5 months, I've thought perhaps Bert had a brother. I'd been having some of the same symptoms as before, and so they started testing me for another cyst. My friend Lynette from church prayed that God would touch my body, and I thought that was nice. I go in for an ultrasound, and there was nothing. I was curious, but knew that the pain would be starting in a few days as it had the last 5 months, and maybe then I could better tell he Dr. where it hurt. She sent me for a CT scan, just to be safe, as well as had bloodwork and all that done, too. I went in yesterday. CT scan was clear and even my cholesterol and bloodwork was normal and everything! Then, I realized - I didn't have the pain this month. At all! We didn't pray about my cholesterol-but God took care of it. I'm healthy and its because of Him! Praise God! !